What a show! Acres of everlastings, pathways of magenta, burgundy, claret kangaroo paws, with tall dark, handsomely curving branches framing Perth city views. I was off to the city for a not so fun appointment which finished early. An ‘early mark’ that was fun. King’s Park was only around the corner……. how could I let the opportunity pass me by? 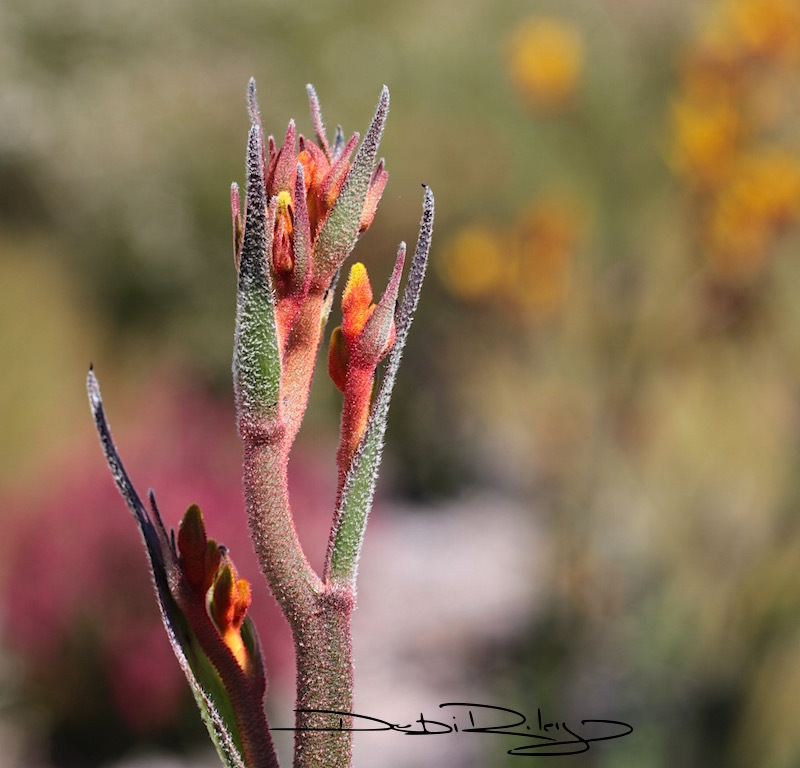 Spring is short here in Western Australia, with high heat soon forthcoming. Then, all the bright and pretty spring flowers will be long gone! Make hay while the sun shines. 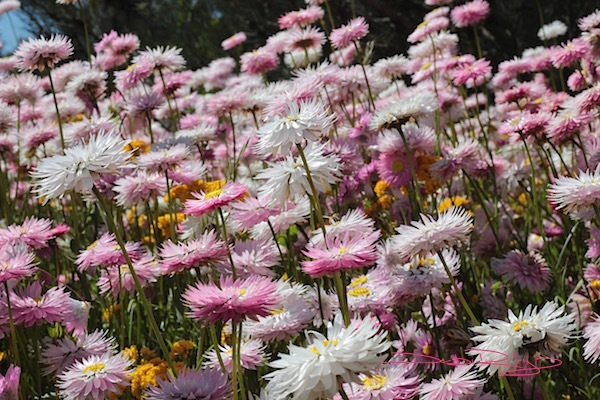 My blinker got put on and I pulled into Perth’s largest native flower parkland. 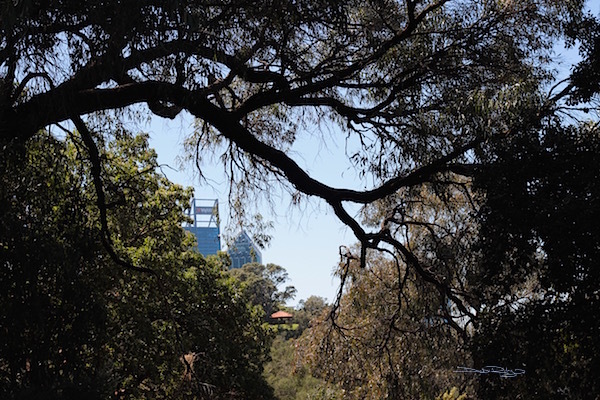 King’s Park makes the list of some of the world’s largest inner city parks, and boy, there are a lot of pathways! 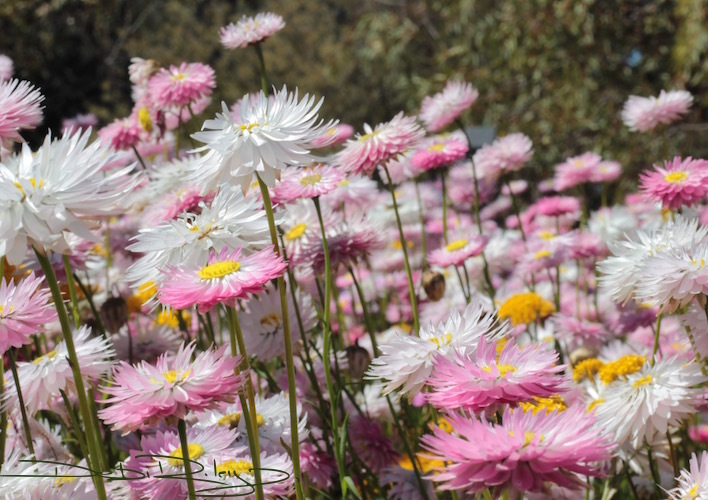 King’s Park is certainly captivating and unforgettable, its also one of Western Australia’s top tourist destinations. 400 hectares, 4.06 square kilometres of inner city parkland with 3,000+ flora species that come alive in September every year. So glad I put my blinker on. 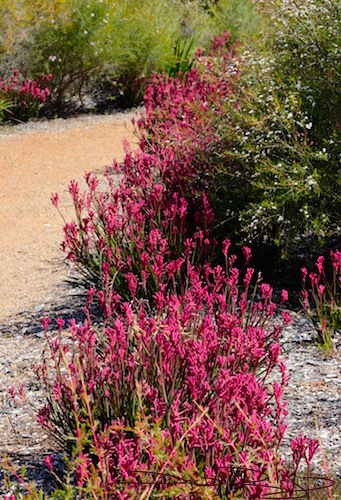 A myriad of pathways of magenta, burgundy, claret kangaroo paws everywhere I turned around. Tall dark, handsomely curving branches framing the city with spectacular peek a boo views caught my eye and my imagination. I walked past, looked back, then returned to take the shot. When I arrived there was a full scale children’s event and festivities underway. There were kids everywhere, noise and yelling and loudspeakers and music blaring. I was a bit surprised, as it was midweek not a weekend. I’d anticipated a leisurely tranquil stroll thorough the park. Thats not what I got! However, I did like the ambience of joyfulness, happiness that pervaded the atmosphere. So all up, the noise and commotion, …. it just added to making it a wonderful and happy experience. I did learn something while wandering the gardens and lawns, listening to the Aboriginal educational speaker on the very loud, loudspeaker. Nyoongar are the Aboriginal People of the Perth area and its their language they were sharing with the crowds. “Yonga” is kangaroo. Also, “Up” means place of. There are many towns here in W.A. that end in “up” and I’d been wondering what it meant. Now I know. “Djirip-djirip” means Very Happy. “Mootjool” is the yellow everlasting flower. I spied a lovely native tea tree, with blossoms delicate and slightly fragrant. 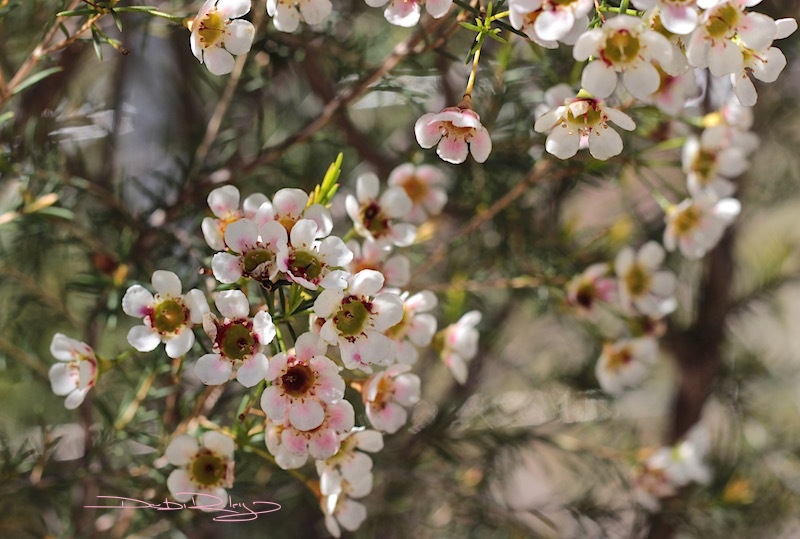 Love the softness and romantic feel these gorgeous tiny flowers give. Many native plants have been used historically for medicinal purposes, the tea tree is one of them. The tents, the trees, the blossoms…. a lovely day! 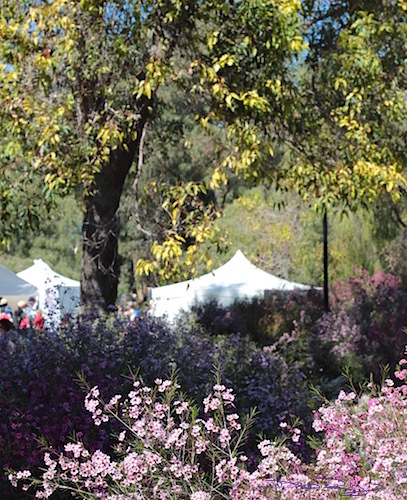 If, you get over ‘west’ to Perth in the spring, I can highly recommend the King’s Park as a delightful and a …. Very Happy “djirip – djirip” place to go. I can say I’m very happy for the early mark and deciding to turn my blinker on!! hi Joshi, thank you for stopping by and your kind comment ! I had a great time at that park 🙂 glad you enjoyed it too! hoping your weekend is fabulous! thank you so much for your lovely comments, very kind 🙂 It is nice to know others read, and enjoy the posts. so thank you! thanks Jodi 🙂 it is odd. even for me after 20+ yrs here, at times I stop, think, WHERE AM I?! LOL. we did return to USA for 6 years, then back to Aus so that didn’t help. look forward to your fall pics! Laura, thanks! you picked my favs too 🙂 I was lying on the ground, rolling this way and that… trying to get “the right shot” IT Must have looked hysterically funny! Hi Debi, thanks for the travelogue about Kings Park and the Aboriginal language, very interesting. Your photography is beautiful. I’ll enjoy your spring weather as we head into fall. Hard not to love these photographs Debi – wonderful and uplifting. Great photos and an interesting post! Excellent! Hi Katherine, thanks for stopping in and your very kind comment!! I’m pleased you enjoyed having a look. Some of those shots, I was laying on the grass, while people were…. staring… 🙂 oh dear!